Saw an evocative orange-red stripe to the east, at least from high ground. Couldn't see it as I neared the train station. A "sailor's warning..."
Noted a very soft crescent glowing in the south. I just learned that tomorrow's Recreational Astronomy Meeting for the RASC Toronto Centre is cancelled. This is because of the impending heavy snow. Issued my double star "bulletin" for February 2019. It is a short list of suggested targets. I shared this on the RASC Toronto Centre forums. And I post here for all. If it isn’t cloudy and grey, it is bitterly cloud, it seems. Such that it is, here are some double and multi-star targets for your consideration for February. Remember double stars work in the city as well as in dark skies. I look forward to hearing how you did! Any questions? Tried LED dimmer again, with my little custom Telrad heater with resistors. Heat came out! Whiskey tango foxtrot, I thought this thing didn't work?! Carefully measured the amperage with the (repaired) Micronta multi-meter: 0.11A. Huh. Kendrick 8" heating strap: 1.0A. Hacked Heatech cup warmer: 700 mA. Tested the Kendrick 2" strap with the Micronta audible continuity resistance setting... and was able to get a tone when I bent the strap a particularly way. It has a broken wire! I don't know what happened... I don't remember now. But it seems that in late-January I was doing lots of little tests and checks and I had a malfunctioning multi-meter as well as an erratic dew strap. Looking back, the cheapo LED dimmer had worked fine. My theory is that the dew strap itself was not working (hadn't been since early January) and it didn't draw any power from the dimmer circuit so I assumed the LED dimmer was bad. Buttoned up the dew heater controller. It works well. Now I can battle sultry nights on two independent rigs. Cut the lead wires from the components off the bottom of the finished printed circuit board. Cut the test power feed. Used thermal paste between the sinks and the big transistors. Finally drilled the PCB for the large wire of the reverse polarity Schottky diode and connected the positive power input line. Tried some plastic standoffs with tiny screws with hot glue but I wasn't really happy. Hacked some shrink wrap tube cut very short and used contact cement. Wired up the fused Cigarette Lighter Adapter with heavy wire, cut a bit longer than my Kendrick controller. Attached the case parts. Stoopid skating drill bits; should have used a press. Installed the Richlok plastic strain relief. Soldered the big pots and the indicator LEDs. Pressed the LEDs into place; locked. Soldered the shell tabs of the RCA female connectors in advance. Tightened the RCA jacks with a 9mm spanner. Once the PCB was glued in place, I soldered the RCA plugs on their centre pins. Glued the power switch into the case. I wanted to use removable connectors to the tabs but they were too deep so I (carefully) hard-wired the SPST. Heated the shrink tube on the power feed. Closed up the box. All done. Tested. Works good. In a moment of inspiration, printed up some labels. Shared the photo with Charles on Facebook. He quickly responded: "When we're observing and it's hit the dew point and our dew controller is already on ten and we need a bit more to get us over the edge we can go to eleven." Couldn't have said it better. As we rose above the clouds, I noted the Moon, getting bright, high up. Couldn't view it straight on until the plane banked right. Saw Sirius. Bright, blue-white, intense. Then I saw deep orange Betelgeuse, and when I squinted, without my eyeglasses on, all of Orion. Very dark sky above the pale blue clouds below. w00t! 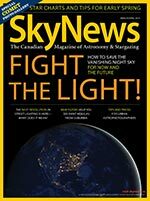 Received the latest SkyNews magazine today. Excited to read this one with the cover emblazoned with Fight the Light! Content on light pollution! We must fight the light! Inside, after a quick skim, I noted lots of wonderful photography including shots with the Pleaides and comets. I also look forward to reading the piece on astroimaging inside city limits. I need all the help I can get. It took me a while to resolve the dew heater controller circuit problems but it is done now. Circuit works. I sorted an issue with the switching transistors. Initially, I mistakenly used the same pin position assignments for the 2N2222 and TIP31C pieces. 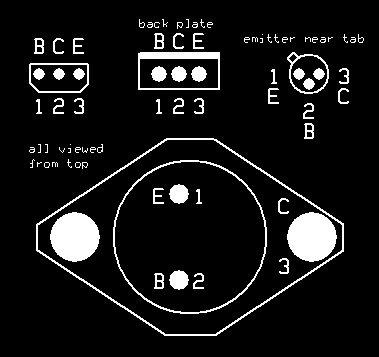 I learned that you need to go back to the schematic and ensure the pins of the physical part correspond to the schematic. After testing a simple 555 schematic from Math Heijen, I successfully debugged my soldered 556 board layout. Carefully comparing the schematic and board layout, I found the error. It was caused by a fault back in mid-January, when I first considered the board layout and I changed from the stock diode object. With my "custom" diode part, I flipped the polarity. 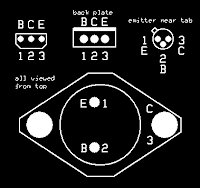 I edited the part polarity in ExpressPCB and repaired the board. The board has left and right sections meaning the left R1 potentiometer controls the power output to heaters H1 and H2 and which is reflected in diode D5. Close examination will reveal the correct orientation of the signal diodes. It's a little messy around the TO-18 transistors but the traces drawn indicate where the long legs were attached (when possible). The offsetting (again) of B1 and F1 show the power source is outboard and the fuse is inside the CLA plug. Cut the long 4-40 bolts for the heat sinks (first time doing that with the GB wire stripping tool). The PCB was (nearly) done and working. The heavy gauge red and black wires (in the photo) at the upper corners of the PCB are for the heater networks of course. The yellow, purple, and black wires at the bottom corners are for the pots. In my case, the black wires are for the middle pins. You can clearly see one of the indicator diodes; the other is cropped out. The black wire going from the middle of the board straight up in the negative 12 volt power input. I used the red lead at the bottom-right as a temporary feed into the PCB. Spotted a crescent Moon, slowly darkening, slowly dropping, as I trudged home from the bus stop. Hello! Wasn't expecting anything. 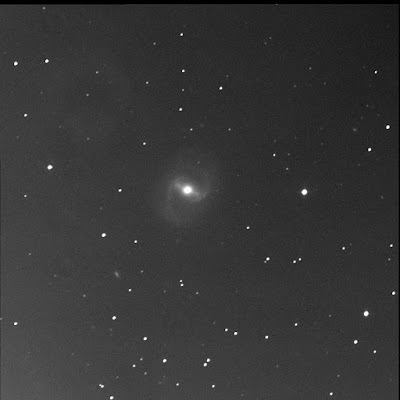 But emails started rolling in from the Burke-Gaffney Observatory as it imaged Finest NGCs starting with 3432. I'm hoping to improve on the quality. Last capture was on 19 Apr '17. Unfortunately, no better... Average transparency and poor seeing. The new ECMWF forecast showed increasingly clouds. 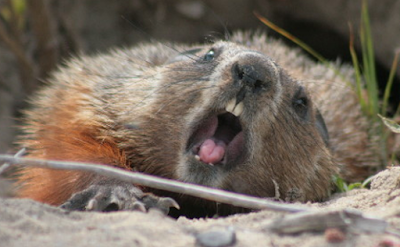 I dunno about you but if I was a marmot in Canada, I wouldn't be crawling out of my den in this weather. 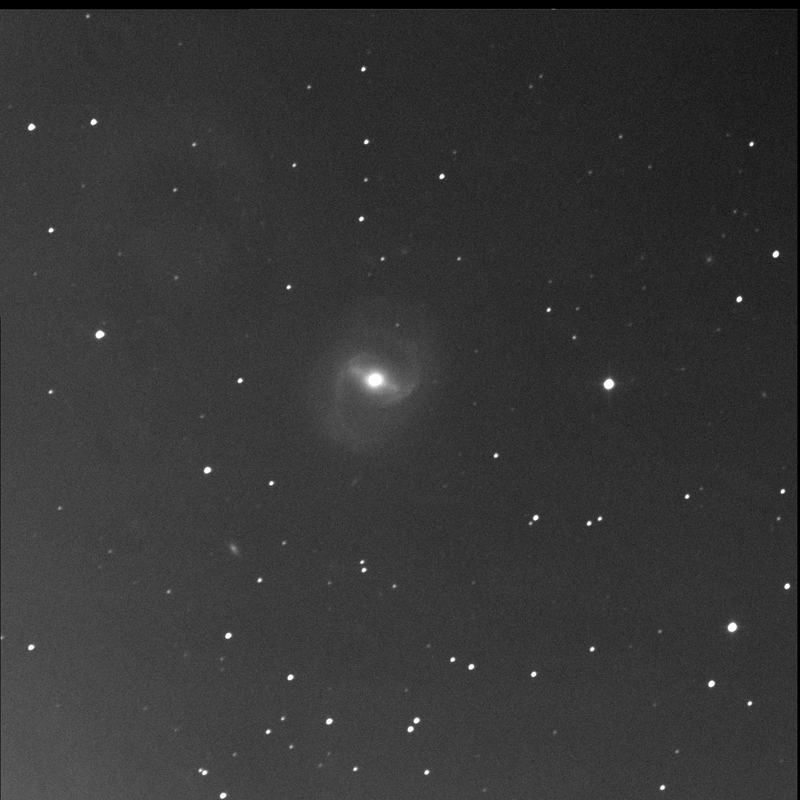 I ordered the BGO robot to image Messier 59. 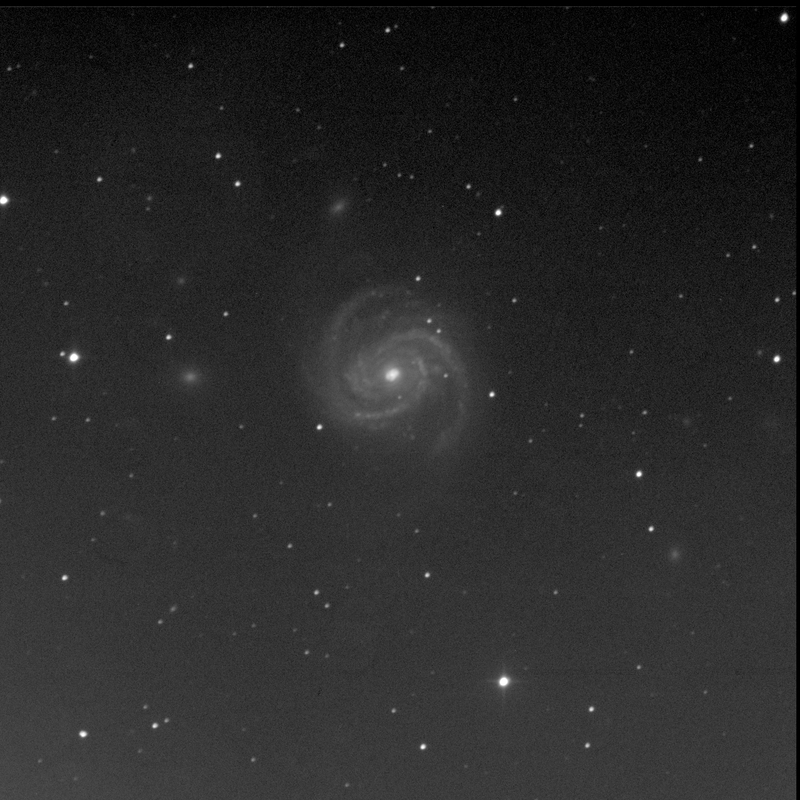 Another single-view Messier. 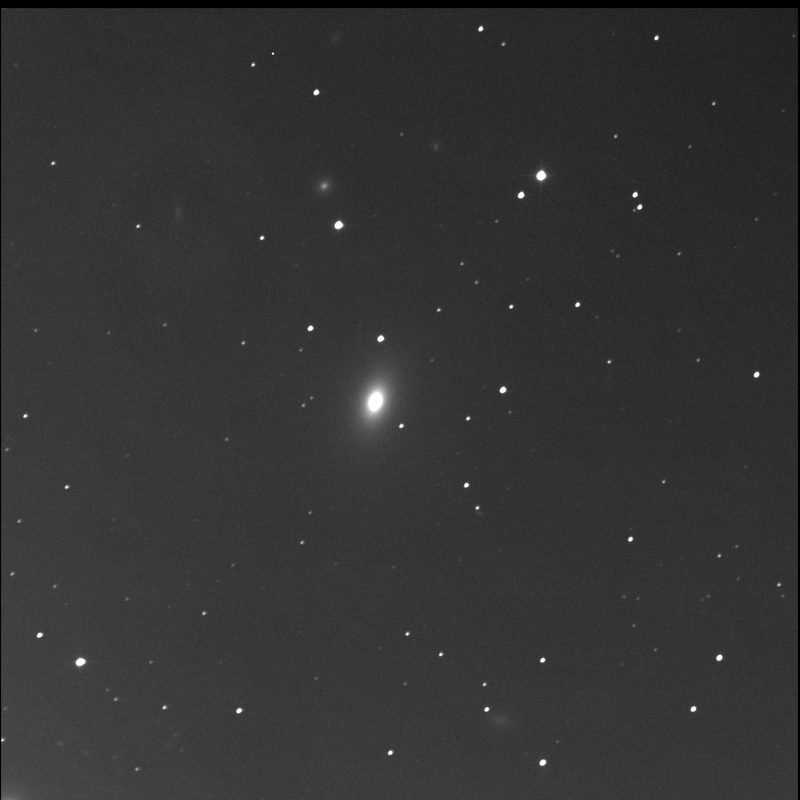 I first took in this bright elliptical galaxy in Virgo on 4 July 2010. 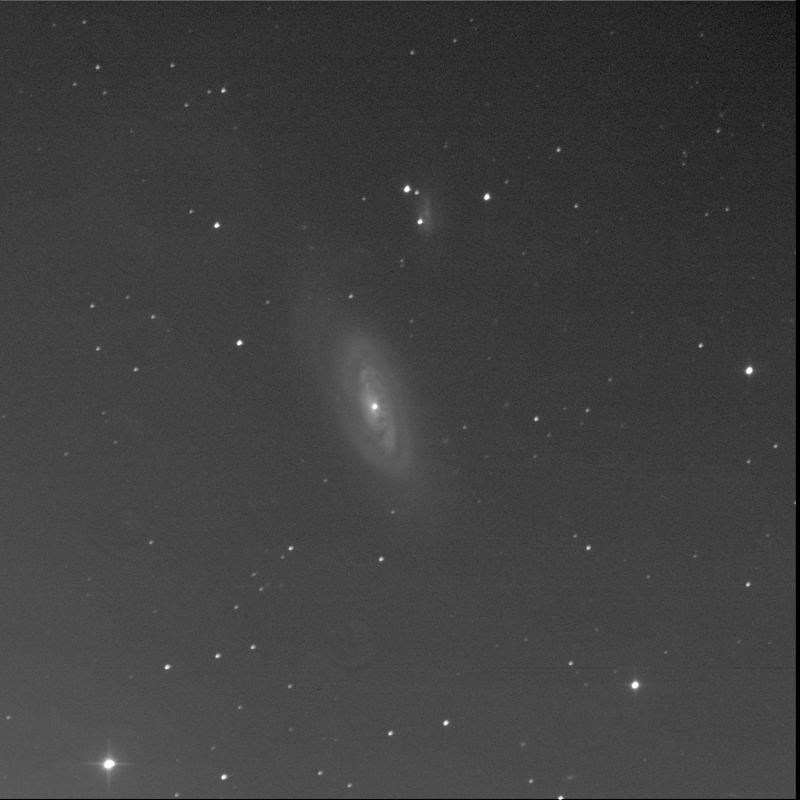 M59 aka NGC 4621 is big and bright with a fantastically bright core. It is oriented north-west, twisted slightly to the west or clockwise in this image. To the north, and slightly west, a good distance away is a very faint round lint ball. 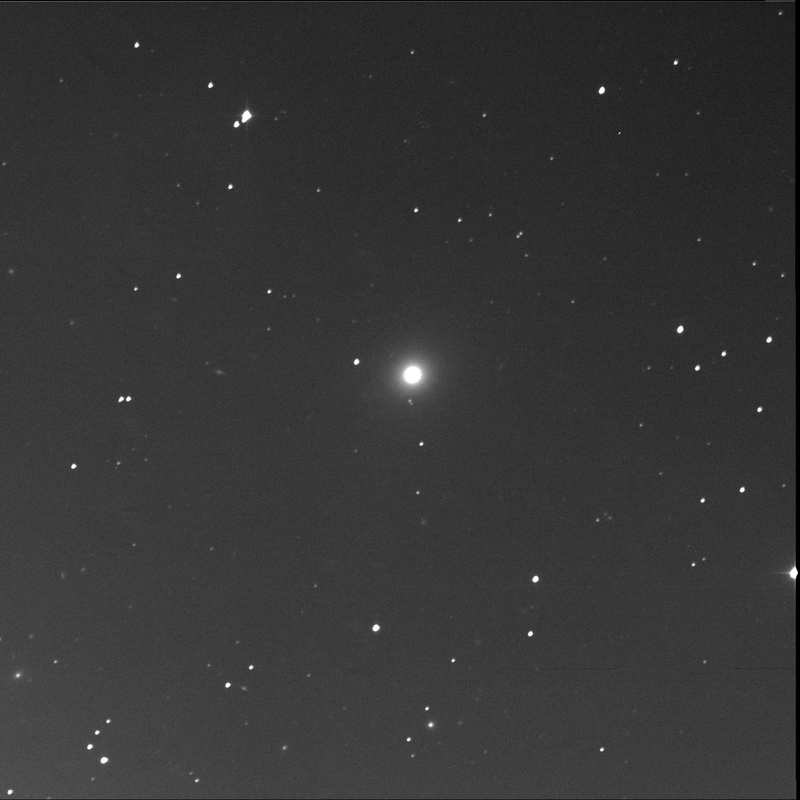 This is LEDA 1398556. 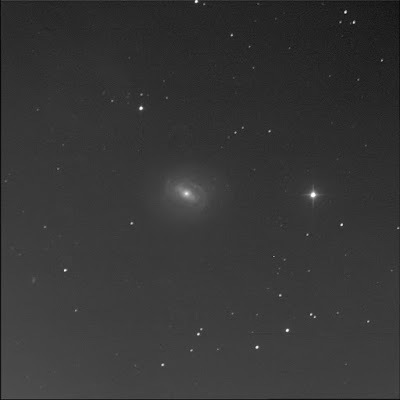 IC 3665 lies to the south-west, a large diffuse fuzzy. To the north-west is an elongated patch, oriented north-south. I believe this is LEDA 1398085. SkyTools 3 Pro also shows PGC 42679 here but it is opposed, oriented east-west. I don't see another galaxy here. Nearby, further west, is the bright round diffuse galaxy IC 809. 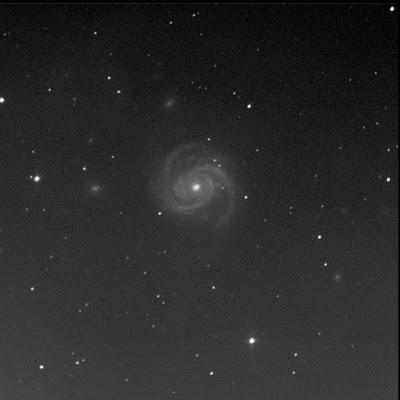 Due north of 809 is a faint oblong but large fuzzy: PGC 42634.